Having to choose a proper kayak for your fishing undertakings is something that you should definitely take into account as it is not a walk in the park. There are quite a lot of different specifications which are going to be of importance when it comes to comprising the integrity and convenience of the final product and you need to be well aware of them all. Unfortunately, to someone who doesn’t have the necessary experience, doing so could be incredibly burdensome and it is undoubtedly something that could quickly get overwhelming. This is the main reason for which we have taken the liberty of providing you with one of the most convenient paddle-propelled kayaks on the market. 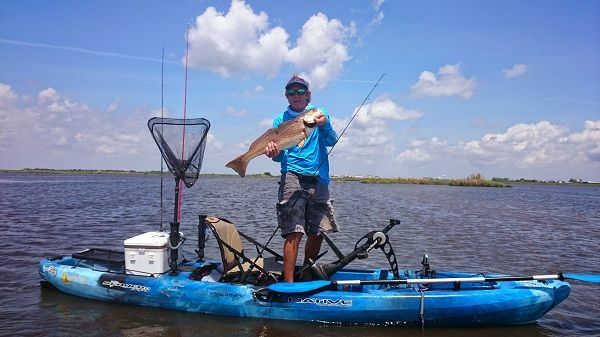 The Native Watercraft Slayer Propel 13 Fishing Kayak 2016 is considered to be a game changer when it comes to its overall ability to maintain casting distance as well as to pull away from structure or to stop right on the dime when trolling in order to relieve the pressure of the rod. It is designated to easily suit different fishing styles and is a reliable enough to provide you with everything you may need for splendid fishing undertakings. The truth is that the 13ft design is something which is going to enable you to reach up to 5.2 miles per hour, which is not something to be underestimated. It is a formidable speed which is definitely going to perform well in the wind. This is a unit which is designated to be used in calm waters, though, and it is honestly not going to do well in white water but it has never been intended to do so anyways. With this in mind, it is important to understand that the product is particularly convenient for fresh water fishing in ponds, lakes, dams and in slow moving rivers. Now, this is pretty much the basic information that you have to be aware of in order to determine whether it is something you are looking for. 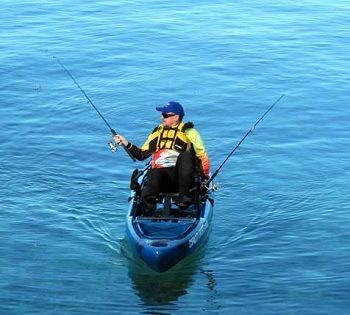 It is a straightforward fishing kayak and it is not intended for recreational usage. With this in mind, let’s dig a little bit deeper and take a look at the specifications. There are different types of kayaks when it comes to the way they are powered up, so to speak. There are kayaks who have place for a small motor, there are ones which are only paddled and then there is this one, which is a combination of a paddling kayak and one which uses a pedal to put it in motion. As a matter of fact, the kayak comes with a revolutionary pedaling system which will allow you to go back and forth with and absolute breeze. Additionally, the fins on the bottom of the kayak make it convenient to navigate. The 13ft. length is something which is going to ensure that everything is handled conveniently and as per the highest standards. This is definitely something that you should take into account. There are a few things which are going to determine how stable the kayak actually is. The first thing is the width – this is likely to be the most important factor when it comes to it. This is a rather standard 33-inches wide unit which is going to provide you with the necessary initial stability as well as proper tracking stability as well. This is definitely something which makes it friendly for both beginners and for advanced users. 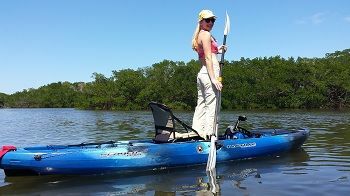 At the same time, the product is rather quick thanks to the overall hull design and the convenient length of the kayak. At 13 ft., you can rest assured that it is more than enough to reach the aforementioned serious speed of up to 5.2 miles per hour. The product is of stable polyethylene construction, making it durable and rather stable. 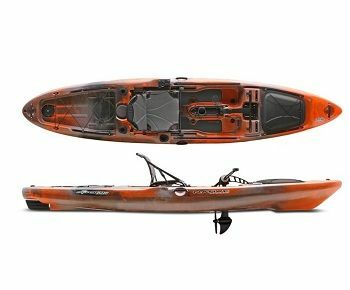 It comes with a properly modified tunnel hull in order to ensure that the tracking capabilities of the kayak are enhanced. The construction is pretty much the thing which makes it incredibly durable and high-end. This is also one of the reasons for which it is rather expensive in comparison to simpler options. Despite the extruded and hardened polyethylene construction, the product is actually rather lightweight. This is definitely something convenient as it is going to ensure the speed and maneuverability of the unit as well as the actual speed capabilities. The product comes with a range of additional perks, all of which are incredibly convenient and they should be taken into serious consideration. There is a hand sewn 1st class seating. This is something which is going to ensure comfort and usability beyond basic comprehension. There is a right hand forward facing rod holder for your fishing utilities and for one which is going to be incredibly convenient. 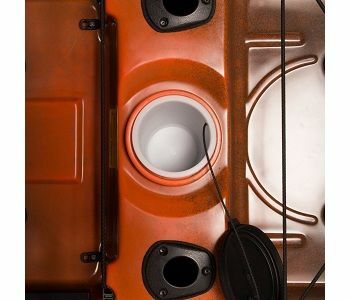 With all this in mind, it is incredibly important to understand that this is a product which is specifically designated to ensure that your fishing trips are of up to the highest standards. All in all, this is a kayak which is designated for people who are into angling. It comes with everything that you might need for it. Additionally, it is also perfect for a range of additional undertakings but it is mainly intended for this. All of its equipment capabilities have been designed with this in mind. It comes with serious storage capacity which is capable of handling everything you might want to take on a regular fishing trip. The unit is rather expensive but it is definitely well worth the money. Everything is handled as per the highest standards and this is definitely that you should take into account. The forward and reverse moving pedaling system is something which is particularly convenient and it enhances the overall mobility of the unit on different surfaces. The kayak is great and it will enable both beginners and experienced sailors to handle it with ease.